What all comes to your mind when you think of attracting customers to your restaurant? A well managed and attractive infra, quick services, experienced staff, and using the latest technology services at your restaurant. That's all? But let me tell you right here that apart from these factors, there is one thing which most of the restaurateurs miss out. No doubt an attractive infra and quick services is a must to capture customers, but having an effective menu is one of the most prominent parameters to gain customers' attention. The way you present your menu to the customers puts a direct influence on your customers and further decides whether the customer will visit again or not. Your menu is going to represent your brand name, so you need to emphasize on the way your menu is planned, designed, and displayed to the customers. And a restaurant menu analysis is going to analyze the profitability and popularity of each menu item and thus resulting in effective sales for your restaurant. How to do restaurant menu analysis? Menu analysis would not at all be an easy task as it demands a serious in-depth research and planning. And the best time to analyze your menu would be when the sales are falling and the profit percentage is decreasing. At this moment, you need to catch some smart steps and know the necessary tips which can help you in fetching the most out of your menu. So, here is a list of tips to carry out restaurant menu analysis perfectly and get more sales and profit in return. Understand Your Competition: The most important thing which you need to consider is to understand your competitors. This will assist you in setting competitive prices because if you charge overpriced charges as compared to other competitors, customers won't prefer your food; and if you are charging very low, then be ready to face financial losses. Check Your Menu Profitability: Keeping a track on profits and sales is a must to keep your restaurant moving. You need to analyze the food items properly about which ones are more preferred by the customers and more likely, are those food items a high-profit item or not. It's necessary to maintain a proper balance between the customer preferences and the profit you set. Take Customer Feedback: Carrying out everything on your end just not solves the problem. You need to get regular customer feedback and get an idea about what customers like more and in which food items do they show dis-interest, or maybe the services which they don't like. So, take customers feedback either by manual methods or by using POS systems where they can write down their reviews. Stay Updated with the Trends: No doubt you have an impressive menu, but you need to stay up to date and change your menu with time and latest trends. Changing the menu items or pricing list is not all, you need to focus on the menu design, layouts, appearance and other parameters too. And if you are still struggling with a paper menu, it's really high time to switch to a digital menu. It’s All About Teamwork: Being the restaurant owner, it is completely your duty to keep track of each and everything. Right? But while you go for analyzing your menu, it is necessary for you to take out enough time and sit together with your staff, chef, managers, and the serving team. Getting their views would give you a clear idea about the recent trends in the food business and the requirements of your restaurant. Choose the right vendor for your restaurant! Want to drive your food business to the whole new level and stand unique in the food industry? jiMenu lets you do that. 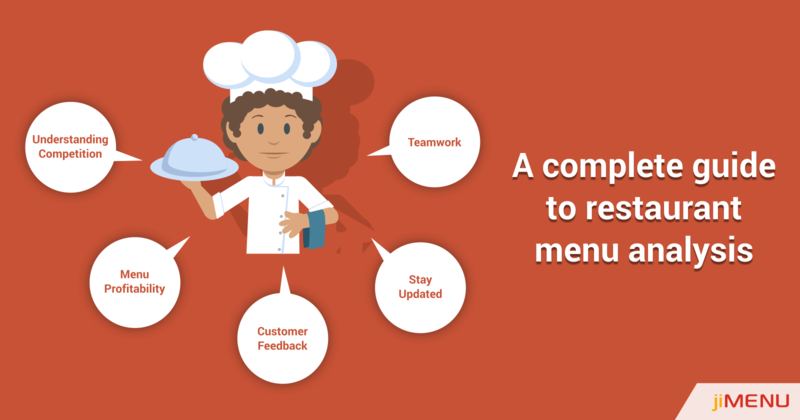 jiMenu offers you complete digital menu solutions while delivering best customer experience and streamline your restaurant tasks. Still confused? Get in touch with us at any time and give us a try!